Hawthorne spent his college years building friendships with the likes of Henry Wadsworth Longfellow, future naval commander Horatio Bridge and future president Franklin Pierce. After graduating he began to spend much of his time reading, writing and researching his family’s Puritan past. He published his first novel Fanshawe anonymously but did not receive much attention. 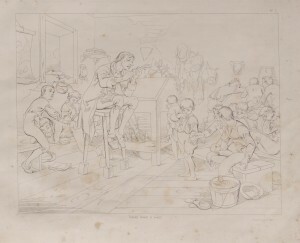 Eventually, his school mate Bridge convinced him to publish under his own name and without Hawthorne’s knowledge put up money to guarantee any losses with the publisher, Samuel G. Goodrich. Twice-Told Tales, a short story collection published in 1837, was a success and received a few favorable reviews including one from his friend Longfellow. 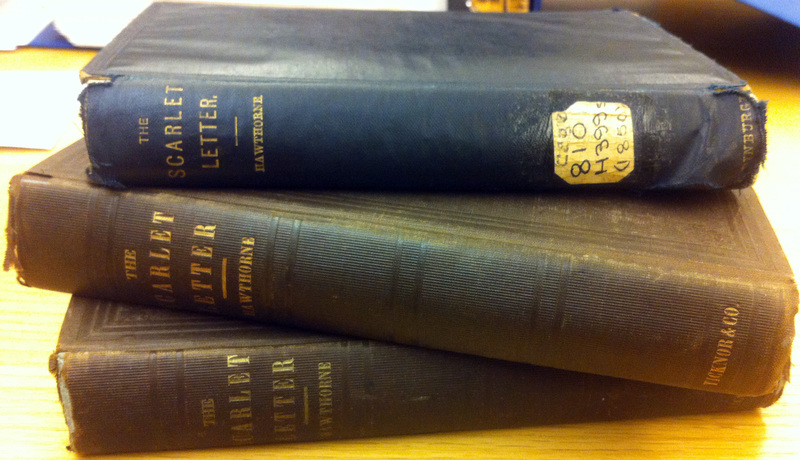 The Watkinson Library currently houses three 1850 editions of The Scarlet Letter, two American publications and one from England. To assist in distinguishing them from each other, I was referred to Jacob Blanck’s Bibliography of American Literature (v.4), also a part of the Watkinson’s collection. Overall it provides more than 37,000 records of literary works from American writers from the American Revolution to 1930. James L. Harner, who wrote the resource book Literary Research Guide, refers to it as “one of the monumental bibliographies of the twentieth century.” In it I found a flawless description of the first edition with basic information including the publishers (Boston: Ticknor, Fields and Reed) and further specifics including the type of cloth the cover was made from as well as the kind of paper used (“yellow end papers, cream end papers”). The publisher’s list on page 4 is dated March 1, 1850. The second edition by the Boston publishers was “extended by the addition of a ‘Preface to the Second Edition’ dated March 30, 1850.” where Hawthorne stated he wouldn’t change a word regarding the Custom House chapter, the semi-autobiographical introduction. 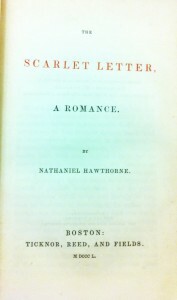 The last version of The Scarlet Letter that the Watkinson holds is a second edition printed in London 1850 by William Paterson. It was not listed in Blanck’s bibliography. Slightly smaller in height and owning a black rather than brown cover it was easily discernible from the American versions. But once it is opened, exactly the same classic novel sits inside. The Scarlet Letter received instant and enduring success because it addressed spiritual and moral issues from a uniquely American perspective. 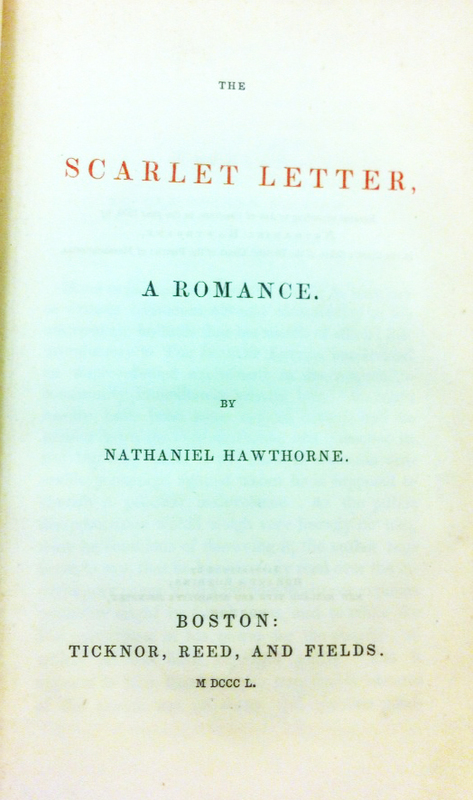 In 1850, adultery was a scandalous subject, but because Hawthorne had the support of the New England literary community, it became accepted as suitable for the masses. The Scarlet Letter is widely considered to be Hawthorne’s magnum opus. This psychological tale of passion, revenge and redemption still resonates with readers today. A Bibliography of Works in English on Playing Cards and Gaming, compiled by Frederic Jessel, is a chronicle of all written works that reference or discuss subjects surrounding and including playing cards and gaming. Jessel was the dean of the Bodleian Library at Oxford University and one of the foremost collectors of books about playing cards and gaming. His bibliography is still considered the standard authority on the subject and serves as the foundation for the continued collection of works about gaming in all of its forms. The fact that this book still holds weight amongst historians studying this subsection of history speaks to its niche nature, but also substantiates the longstanding historic curiosity and intrigue that surround the often-typecast world of gambling, gaming and cards. There are 1700+ unique bibliographic entries in the text, covering a massive variety of different games. The subject matter includes everything from illustrated informative rulebooks like Winterblossom’s 1875 text, “The Game of Draw-Poker Mathematically Illustrated,” to more psychologically minded texts that explore the compulsions and dark side of the gambling culture. I discovered a catalogue for a collection by a rare book collector and trader, Natalie Galustian, titled All In: A unique collection of ﬁrst and rare editions, photographs and prints on poker and gambling. When cross-checking this catalogue’s contents with Jessel’s bibliography, almost all of the works that bore the indexed label of poker and fit the time frame were a part of this catalogued collection. Since “All In” allegedly sold to an unnamed buyer for a sum of over $200,000, it is clear that Jessel’s work served as a foundation for a collection that holds the interest of modern collectors. Galustian was quoted as saying “The collection traces the development of the game through the 19th and 20th centuries, and shows how the wealth, quality and scholarly nature of the writing on poker proves it is a game of skill, not chance.” While I cannot speak for Jessel, the fact that he took on the challenge of chronicling the literary history of gaming in English suggests that he shared in Galustian’s sentiment for gaming as a whole. The existence of the resource he created allows someone to reference all of the scholarly writings along side everything else and draw their own informed conclusions about where gaming fits into the world. While the impact of this book is specific to the subject matter it addresses, I think that the most important lesson I learned from my experience with this book is the role that a bibliography plays in collecting as a hobby. I would imagine that the bibliography is the foundation for many collections as it allows for a collector to serve their subject matter with the due diligence and background that will allow for fulfillment of the collection’s true purpose. If a collection seeks to preserve a time period, or concept in history through its presence, it must offer an unbiased and complete documentation of all the relevant books and texts associated. The work of a bibliographer and a collector are inherently linked, as their respective work can often serve a common goal. Just as a bibliographer may peruse pre-existing collections to confirm the meticulous reliability of their own work, many of these very same collections and the collectors who created them probably began their journey utilizing the works of famous bibliographers who came before them. Jessel’s work has maintained integrity, as his work seems to be one of the cornerstones for the historical literary contextualization of this subject mater. For me, Jessel’s text helps to confirm the validity and importance that the bibliographic medium provided to the intellectual and literary world. Without a collection of all these relevant texts, there is truly no way of substantiating or contextualizing modern day arguments or histories of any game or the culture that surrounds it. This book served its purpose in a multifaceted way as it not only got me thinking about the chronicled history of the world of gambling, but it also led me to make my first acquisition of a collectible book. After recognizing the intricate and diverse subject matter associated with the history of gaming, I purchased a first edition copy of a history of gambling referenced by Galustian’s All In catalogue. David G Schwartz’s Roll the Bones: The History of Gambling will be the newest addition to an ever growing collection of Poker instructional books and historical narratives surrounding the world of gambling. Utilizing the modern day manifestation of the legacy created by Jessel’s text, All In, I have begun the long process of building a collection that attempts to achieve the context and consistency achieved by Jessel and all those the implore the bibliographic medium. The Legend of Sleepy Hollow illustrated by Felix O.C. Darley (The American Art-Union, 1850). Washington Irving’s The Legend of Sleepy Hollow is a well-known and beloved tale throughout the northeast. The ghoulish story, set in Tarrytown, New York (or rather, Sleepy Hollow), narrates the encounter between Ichabod Crane and the Headless Horseman. This edition is set in large format (32 x 29 cm), containing 16 pages of text and 6 black and white plates featuring recognizable scenes from the story. Interestingly, these illustrations were not published interspersed between relevant passages, but appended to the complete narrative. Subscribers to the American Art-Union would have been familiar with this tale, as it was originally published in 1820. This edition, released in 1850 and illustrated by Felix O.C. Darley, provided a different experience for readers who were well acquainted with the twists and turns of the Legend’s plot. Rather, this publication offers a unique synthesis of illustration and text. Through the lens of another artist (fine, not literary), the overall experience is altered dramatically. 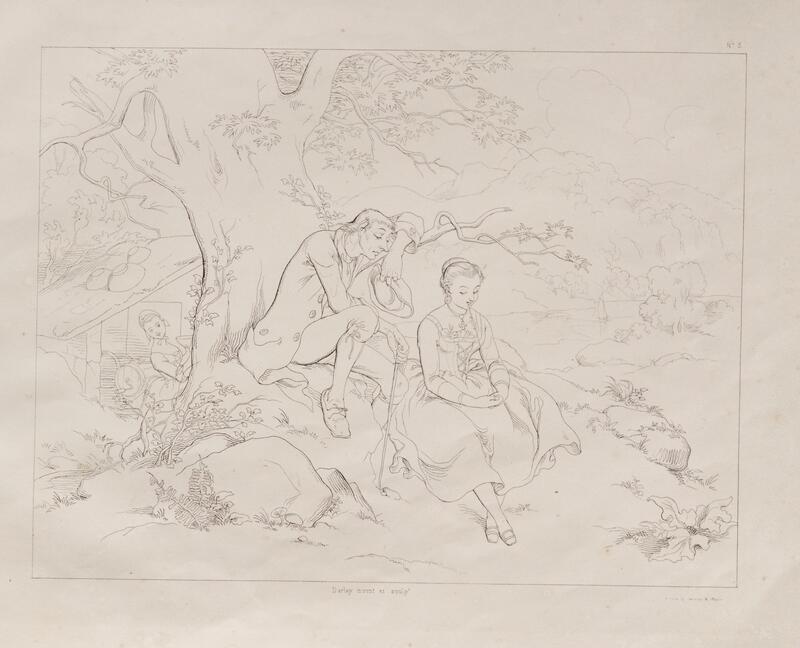 The accompanying images are finely tuned amalgamations of facial expressions, body language, and sparse scenery giving structure to the composition, and grounding the figures within the narrative arc. Unfortunately, the plates are untitled and, as noted, separated from the original text. 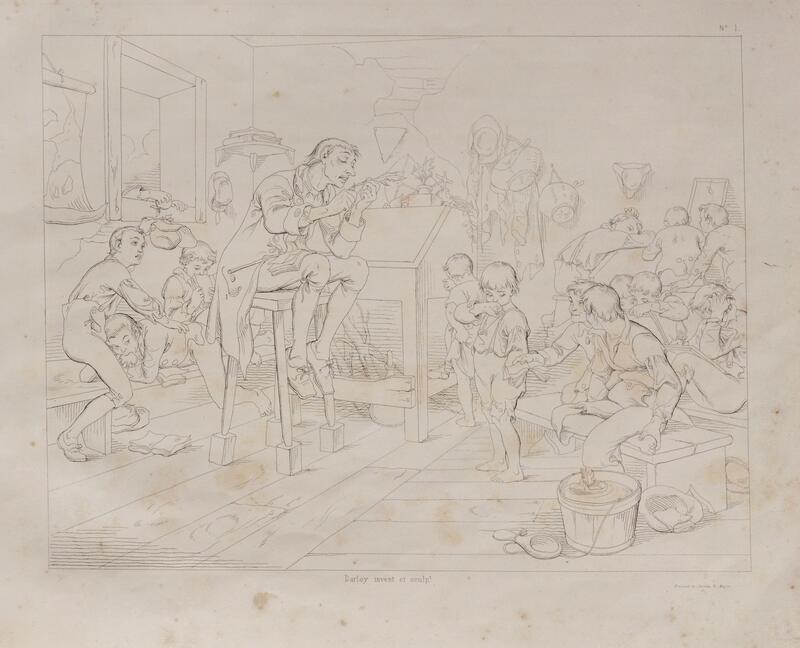 As such, they act as their own narrative, beginning first with Figure 1—a scene within Ichabod Crane’s classroom. Here, the knobby-kneed schoolteacher is surrounded by a group of disinterested, shy, and mischievous young boys. Ichabod stares half-heartedly at a quill held in one hand while he pares away the tip with a tool in his other. In Figure 2, his expression is starkly the opposite. Ichabod winches his head in earnest, gesturing a word of caution to the surrounded group of listeners. One cowers in fear, another stares wide-eyed, and another has drifted to sleep in his arms. 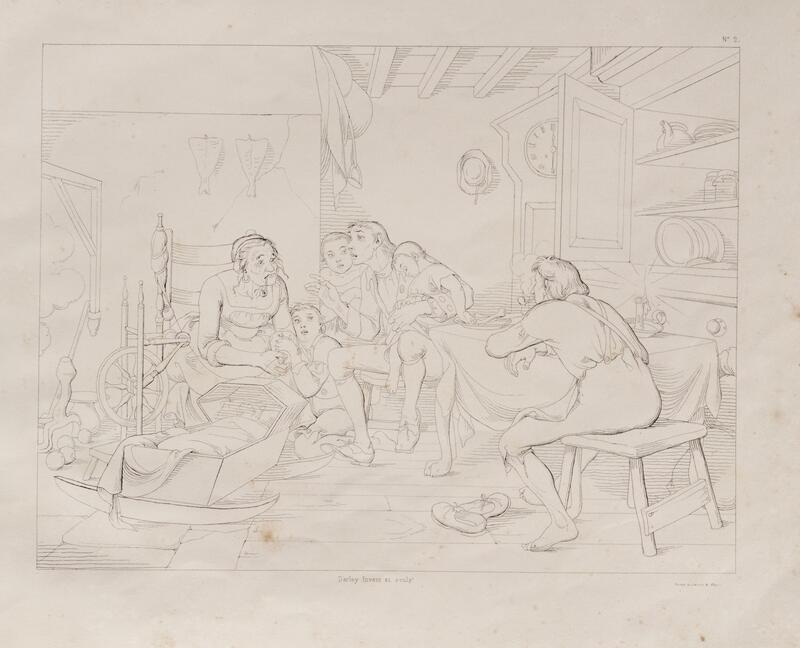 Surrounded by the accouterments of a humble home, this image offers a vision of Ichabod retelling the folklore of Sleepy Hollow, and the legend of the Headless Horseman. 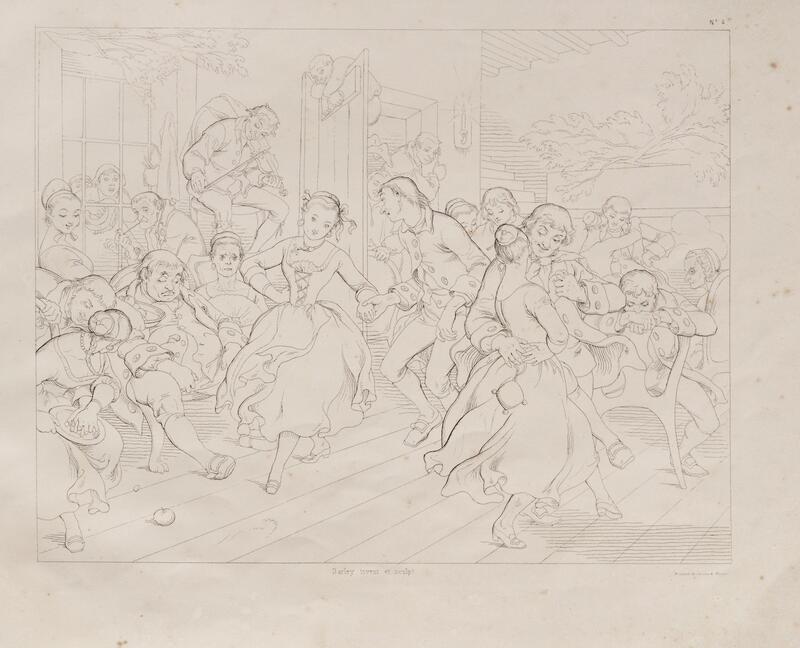 Figure 3 jumps to a scene between Ichabod and the woman of his affection, 18-year-old Katrina Van Tassel. 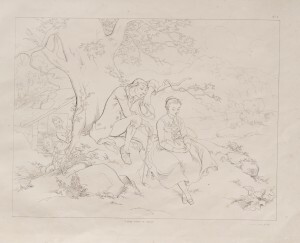 Perhaps the most evocative of Darley’s illustrations, this piece uses the languid tree limbs mirror Ichabod’s limp body posture as he croons over his beloved. Katrina sits firm and stoic, looking away from how downward longing. Figure 4 represents the climax of his relationship with Katrina, as they dance in the center of this composition, Katrina nearly meeting the viewer’s eye and Ichabod looking back at her, again, lovingly. Among the crowd are a myriad of characters—some drunk, some sleeping, some foolish, and some simply enjoying themselves. 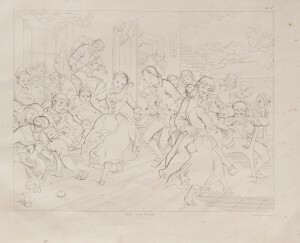 This densely populated scene speaks to the generalized nature of the overall narrative, whereby Washington Irving’s tale typifies a sense of regionalism. His writing seems to apply to the cultural tendencies of northeastern Americans from the early to mid 19th century. As such, the illustration of such figures could prove to be a useful tool in connecting American Art-Union subscribers to the narrative, though published 30 years after its intended audience. Figures 5 and 6 finally reveal the Headless Horseman. 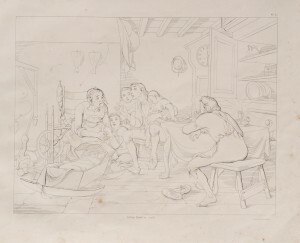 The first shows the character disguised as a traveler, his face turned away from the viewer. In his lap, an indiscriminate round object sits perfectly out of sight. Notably, the rider’s horse seems to be gesturing in a similarly disguised manner. His head is reared down, as if bowing to the oncoming Ichabod Crane, though wide-eyed and seemingly fear-stricken. The facial expressions of Ichabod and his horse are perfectly mirrored—both caught at the brink of a sharp inhale upon the sight of the cloaked traveler and his horse. The horse’s legs are taught and spread, in a stopped and abrupt motion. Ichabod too seems caught off-guard, as his cloak is still billowing behind him. At their feet, a small puff of dust has been disturbed, signaling unrest and disruption. 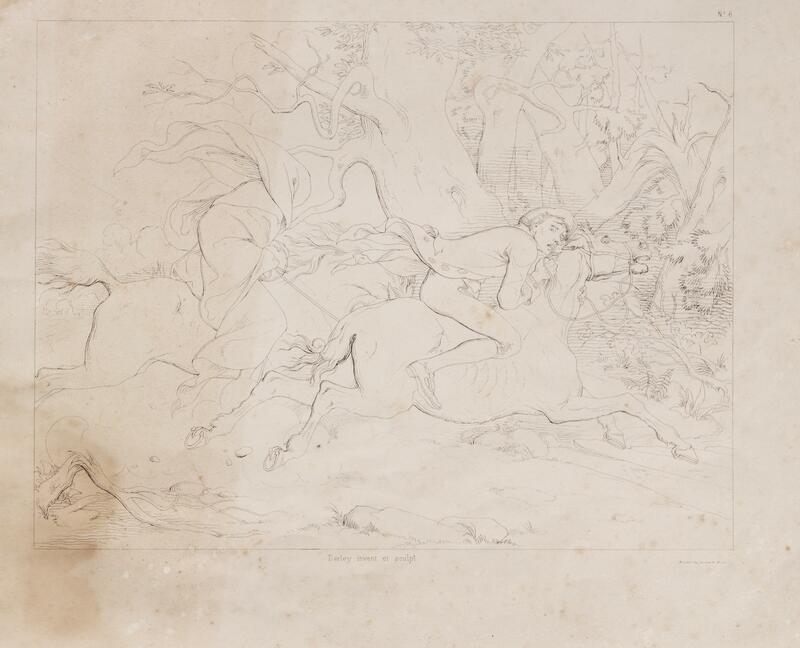 The last plate features the exciting chase between the Headless Horseman and Ichabod Crane. Again, the horses and their respective riders appear with mirrored expressions. The cloaked rider is finally revealed to be “headless”, while the flank of Ichabod’s panicked plow horse hides the other animal’s face. Ichabod and his horse are both painfully wide-eyed in sheer dread. Darley most successfully conveys the stress and tension of the scene within the body of Ichabod’s horse—the visible rib cage, reaching muscles, and taught neck of the animal bespeak terror and desperation as the two clamor toward safety. As successful as these images may be in visually conveying key points in the written narrative, they seem to lack conclusiveness and fluid linear progression. 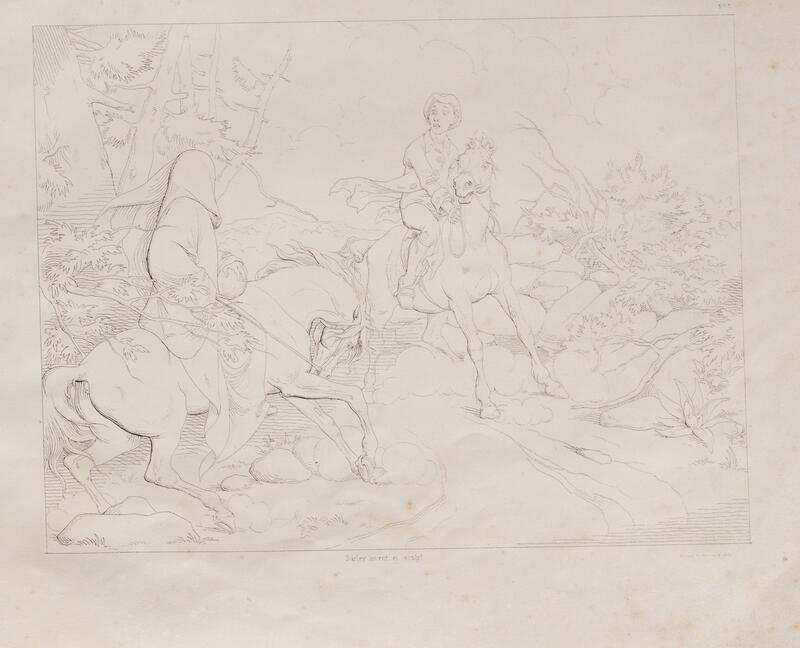 These six plates offer only a few glimpses into the characters of The Legend of Sleepy Hollow. Furthermore, they offer no sort of finality—though the story ends is a rather poignant paradox. True to the story, however, there is no neat conclusion to be backed in a nice bow and handed to consumers of said piece. Rather, the lack of finality in the visual storyboard reflects the integrity of the original narrative, whereby readers are left stunned, reaching back to page one to begin again. A reasonable assumption could be made that books by pre-revolutionary Americans were published before 1776. That is not the case with the scant milestone works by Colonel William Byrd of Westover, Esquire (1674-1744), an aristocratic Virginian known to contemporary scholars of American history, literature, and book collecting as William Byrd II. Byrd’s manuscript of “A History of the Dividing Line in the Year 1728”–the subject being the disputed border “betwixt the colonial governments of Virginia and North Carolina”–was evidently favorably known among a coterie of early American historians and literati, but his first-hand account of exploration was not published until 1841 by a small firm in Petersburg, Virginia. This report, with other short works by Byrd, was re-printed in a two-volume set in 1866 in Richmond, Virginia, and another iteration, edited by the scholar John Spencer Bassett, ensued in 1901 from the major New York publishing house of Doubleday, Page. The Watkinson Library holds the 1841 and 1901 editions, and the differences are striking. The 1841 copy is exceedingly slim, printed on what appears to be thin wood-pulp paper, now dark brown and brittle, the acidic content corroding the white thread binding. The type is small and antiquated to contemporary eyes, and the page margins are exceedingly narrow. In contrast, the 1901 volume, of which only 500 were printed, is lavish: the font size is large, the margins unusually wide, even more so at the page bottom (approximately four inches), the creamy-hued paper is intended to look like laid, and is obviously low-acid or perhaps acid-free, for there is no discoloration. Since the surveyors [charting the latitude] had enter’d the Dismal [Swamp] they had laid eyes on no living creature; neither bird nor beast, insect nor reptile came into view. Doubtless the eternal shade that broods over this mighty bog, and hinders the sunbeams from blessing the ground, makes it an uncomfortable habitation for anything that has life. Not so much as a Zealand frog could endure so anguish a situation. It had one beauty, however, that delight’d the eye, though at the expense of the other senses: the moisture of the soil preserves a continual verdure, and makes every plant an evergreen, but at the same time the foul damps ascend without ceasing, corrupt the air and render it unfit for respiration. Not even a turkey buzzard will venture to fly over it, no more than the Italian vultures will over the filthy lake Avernus or the birds in the Holy Land over the salt sea where Sodom and Gomorrah formerly stood. In these sad circumstances the kindest thing we cou’d do for our suffering friends was to give them a place in the Litany. Our chaplain for his part did his office, and rubb’d us up with a seasonable sermon. This was quite a new thing for our brethren of North Carolina, who live in a climate where no clergyman can breathe, any more than spiders of Ireland. The passage demonstrates Byrd’s erudition, his powers of observation, and gives a taste of his keen and occasionally sardonic wit. Yet reading only a portion of the “Dividing Line” is revelatory, for Byrd could be classified as an early American “nature writer.” To think the “Dividing Line” was penned eight years after the Pilgrims landed at Plymouth Rock, and more than two centuries before Henry David Thoreau went to live at Walden Pond! 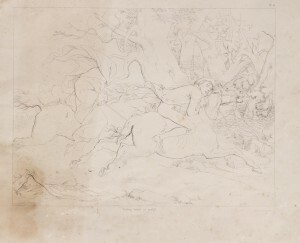 Byrd tells of parakeets flying into apple orchards in the fall, “apt to be loud and mischevious”; of conch shells found on beaches; of wolves, foxes, and bears; and of a polecat (a relation of the ferret), which despite issuing a noxious odor to repel enemies, was killed, cooked, and eaten by members of his company. Byrd explains that the surveying commission took 16 weeks and covered 600 miles. They began surveying at the Atlantic coast, sailing among the coastal islands and inlets, and forging rivers. The expedition was conducted in two parts, in the spring and the fall, to avoid rattlesnakes, which are most active and menacing during the heat of the summer. Rattlesnakes obviously posed dangers to his party (on foot most of the time) and their horses (laden with provisions, muskets, gunpowder, tomahawks, and presumably surveying equipment, tents, and scant changes of clothing). He lists a number of venom antidotes that could be concocted from a number of flowering plants categorized as rattlesnake root and a variety of fern. Byrd also recounts encounters with settlers, and describes how their “homely log-houses” were built. This, from a wealthy patrician who lived in an enormous mansion made of brick! On the trek, his company baptized children of white residents. The party was also regally entertained by what may have been the last remaining Indian village in those parts. He mentions that the natives groomed their hair with bear grease, and that the women were offered as night companions. He appears to have regarded the native people with favor, whereas he deems white North Carolinians as having a “thorough aversion to labor,” and remarks upon the “Slothfulness of the People,” by which he must mean the men, for he mentions that the women begin their work at dawn. He attributes the men’s laziness to the climate. For those who thought early American writing was nothing but reiterations of hellfire and damnation, turn to the stylish, informative, and humorous Byrd. You are currently browsing the I Found It at the Watkinson! blog archives for March, 2014.